There are times when Project Fi just doesn’t behave like it should. It’s rare but it happens and when it does, figuring out how to sort yourself out can be a real time saver. Recently I had an issue where I was receiving calls but it would ring once or twice then roll to voicemail. I did some testing, restarted my Nexus 6 and cleared the app cache but nothing seemed to work. The strange thing was, it started somewhat out of the blue. One day I was fine, next I wasn’t. I spoke with the Fi support team and I got this series of instructions to solve the issue. And solve it, it did. While the steps are a bit involved, it is worth having these instructions handy in case you ever run into this problem. Obviously I can’t promise or guarantee that this will work 100% for you as it did for me – but it should. As you will see after the break, the process is pretty involved and invasive. Also be aware that this involves clearing your device’s cache. To go through this process, you will need to have your Nexus device running on Project Fi and will need to have a paperclip or SIM pin tool to extract the SIM from your device. The step-by-step instructions on how to solve the 1 ring problem can be found after the break. Using the paperclip or SIM pin, remove the Project Fi sim from your phone then reinstall the empty SIM tray. Leave your SIM out of your phone for now. Start your Nexus phone without the SIM installed. You will get a “No SIM” warning but just OK your way through it. Go to Settings>Apps>Project Fi>Storage and in the app settings, tap the Clear Cache button. 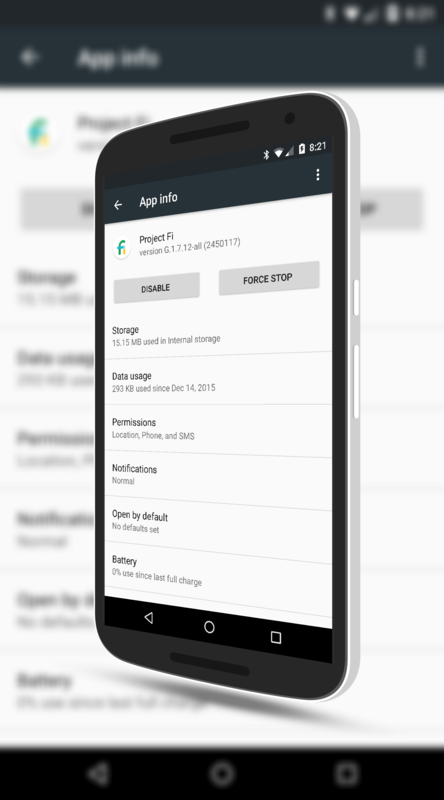 Tap your Home button then go to your Apps and uninstall the Project Fi app from your phone. Go to Settings>Storage & USB (under Marshmallow – Just Storage in Lollipop) and scroll down to Cached Data. Tap it and tap OK to clear your device’s cache. Using the paperclip or SIM pin, remove the SIM tray from phone, reinstall the Project Fi SIM and insert it back into your phone. As you can see, this is a pretty significant amount of work to solve the problem but in my case on my Nexus 6, it solved the problem on the first try. In all, it takes about 5-10 minutes to do all of this so you won’t be out a significant amount of time. This is also one of those How To’s that hopefully you never have to use but keep it bookmarked just in case. For more How To’s, be sure to check out my How To pages. This is a problem I have had for many weeks, without solution. Thanks for posting this. However, when I got the step to uninstall PF, the Nexus 6 would not allow me to do it. I could disable it or load the factory default but not uninstall. Any suggestions? That’s odd. You should be able to uninstall it as it is an add-on app. I would suggest either contacting support to find out why you can’t uninstall it or load to factory default and see if that does the trick. I’m have the same issue as Lew. I can only disable which leads me to believe it is a preinstalled app. I have a Nexus 6p purchased through project fi. I’m able to uninstall the the fi app from my Nexus 6 which was originally on sprint. Ah, so they have baked it in. Try to restore to factory default on the app and see if it cures the issue. Do let me know as I’ll update the post with information if that works. I don’t have a 6P or 5X (Nexus 6) so I can’t test myself. I can verify that it is a baked in app, even on 6P’s not purchased through Project Fi. Mine was purchased from the Google Store and the app came preinstalled. I’m not having this issue to test this solution out with, but when I turned my phone on fresh out of the box with a Fi SIM in it, and the app popped up during the initial phone setup. I too have the Project Fi app baked in (system app) on my Project Fi Nexus 6. I could not delete it. Removing the SIM card, rebooting, disabling the Project FI app, clearing the caches and then rebooting with the SIM card in did not fix anything for me. I also have other problems since an upgrade to Marshmallow: excuriatingly slow app updates; inability to send or receive SMS messages in a timely manner; outbound cellular calls which fail one or more times before succeeding; worst battery life than with Lollipop; on-body Smart Lock detection which doesn’t work. I am going to contact Project Fi support and will report back any solutions. Thanks for commenting Vladimir. Sorry to hear it has been slow since Marshmallow. I’ve had really no issues with my Nexus 6 and Fi since upgrading but I know others have similar troubles to yours. Interesting on the baked in app. That creates a bit of a challenge. Did you try to restore to factory on the app and see if that solves the issue? Project Fi support asked me to check if my problems existed when I booted into Safe Mode (press power button, then press and hold on-screen Power Off? dialog). They did not, so they asked me to boot into recovery and wipe my “/cache”, which I did. After rebooting, all was well! Arrgh. Unfortunately, many of the issues I had are slowly reoccurring. BTW, in answer to Clinton’s previous email: Yes, I uninstalled all the updates to Project Fi, and it did not help.